Sometimes you need a brownie. I gooey, deeply chocolaty, fudgy brownie. Perhaps you want to make a special father in your life something for Father’s Day. Maybe, just maybe, you also want to pretend to do something decent for your body. This is the answer. 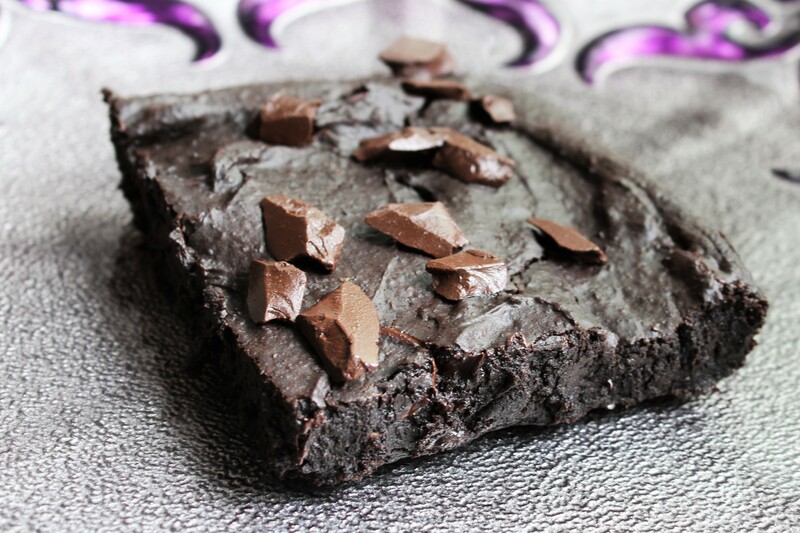 These are delightful brownies in their own right, and they are gluten free, vegan, and made with black beans! You would never guess that there are beans here, and the texture is a delight. These would be a lovely contribution for any party, grill-out, or picnic. Place the rolled oats in a food processor and blend to a flour, about 1 minute. Add the rest of the ingredients except for the chocolate chips and process until very smooth, another 2-3 minutes stopping and scraping the sides occasionally. Stir in the chips, then pour into a greased 8×8 pan. Sprinkle a few tablespoons of extra chocolate chips over the top. Cook the black bean brownies 15-18 minutes until the top looks dry and they feel firm to the touch. Allow to cool at least 10 minutes before trying to cut.